Let’s start with a definition of engagement as in patient engagement… Merriam-Webster defines it as an emotional involvement or commitment. 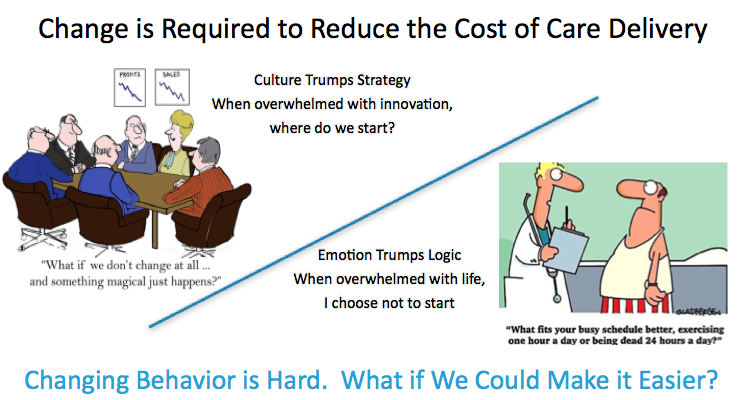 We know that change is required to reduce the cost of care, however when we examine the key stakeholders in the ecosystem we find some major emotional barriers. In one of my last posts, GDPR: Meaningful Consent or Meaningful Choice? Which is more valuable? I introduced several new concepts… let’s take just a few moments to review them. The image above the title reveals the issues — there are two ME’s in this equation… Me (the Corporate Healthcare Organization) and Me the patient. Corporations act as giant individuals. They are designed for one thing — executing on a repeatable business model. And for the most part they do it exceptionally well. Now let’s visit the personal Me, N of 1, the Patient. I suffer from the same problem. Our lives are overwhelming, there’s no time to sit and contemplate as we rush from one thing to another. When overwhelmed, and particularly when the symptoms appear years after my diagnosis, as is often the case with many chronic conditions, I simply choose not to start. It takes less energy and I can rationalize I have time to change when things calm down (which they never do). Emotion has trumped logic. In both cases the Elephant is in control, and the Rider, be it the Corporation or the Individual, is confused, overwhelmed, or simply in denial. They lack the ability, or perhaps the tools, to change to or navigate along a new Path. Three years ago, we were approached by a large health organization — they gave us a simple problem… Figure out how to lower the cost of healthcare? And yet after three years of research my answer is still the same — insure more healthy people. But not by cutting off insurance to them. By making more people healthier. Now, for that to happen we need change. How can we use technology to deliver something familiar and friendly for the Elephant (emotional) and simple and personalized for Rider (logical and rational), which can guide people (and corporations) on a path to better health and financial outcomes? Is it even possible for innovation to remove the barriers to change instead of creating new ones?